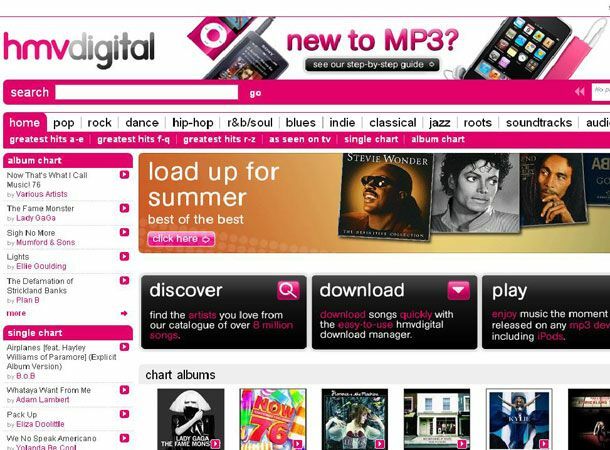 HMV has today launched its new digital music download service that boasts 10 million songs and the entire UK top 40 for just 40p per track. GaGa, Ronson, Jedward and company will be offered at the introductory 40p price which is significantly less than the 79p Apple iTunes currently offers for individual UK top 40 tracks. All music from the HMVdigital service will be compatible with all MP3 players, with most tracks available at 320kbps MP3 quality. Once you've purchased your tracks they can then be automatically synchronized with iTunes or Windows Media player libraries. Unlike iTunes, if you've somehow misplaced or accidently deleted a track you downloaded months ago, you will be able to download the track again. The iconic high street music chain signalled its intention to increase its digital music presence last year by signing a £7.7 million deal to acquire 50% of Spotify music providers 7 Digital, bringing an influx of new music available to HMV customers. iTunes still reigns on the music library front, currently offering users a selection of more than 13 million tracks, but having managed to avoid some of the main gripes with Apple's music service, HMVdigital sounds like a genuine threat to its music downloading throne.